For readers of "The Tiger's Wife "and "All the Light We Cannot See" comes a powerful debut novel about a girl's coming of age and how her sense of family, friendship, love, and belonging is profoundly shaped by war. Zagreb, 1991. Ana Juri is a carefree ten-year-old, living with her family in a small apartment in Croatia's capital. But that year, civil war breaks out across Yugoslavia, splintering Ana's idyllic childhood. Daily life is altered by food rations and air raid drills, and soccer matches are replaced by sniper fire. Neighbors grow suspicious of one another, and Ana's sense of safety starts to fray. When the war arrives at her doorstep, Ana must find her way in a dangerous world. New York, 2001. Ana is now a college student in Manhattan. Though she's tried to move on from her past, she can t escape her memories of war secrets she keeps even from those closest to her. Haunted by the events that forever changed her family, Ana returns to Croatia after a decade away, hoping to make peace with the place she once called home. As she faces her ghosts, she must come to terms with her country's difficult history and the events that interrupted her childhood years before. Moving back and forth through time, "Girl at War "is an honest, generous, brilliantly written novel that illuminates how history shapes the individual. 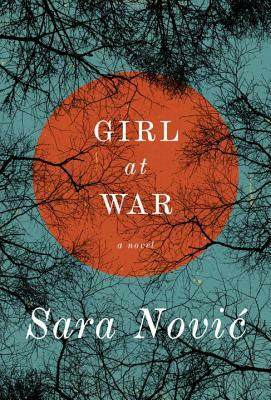 Sara Novi fearlessly shows the impact of war on one young girl and its legacy on all of us. It's a debut by a writer who has stared into recent history to find a story that continues to resonate today. An] old-fashioned page-turner that will demand all of the reader's attention, happily given. A debut novel that astonishes. "Vanity Fair"
Shattering . . . The book begins with what deserves to become one of contemporary literature's more memorable opening lines. The sentences that follow are equally as lyrical as a folk lament and as taut as metal wire wrapped through an electrified fence. "USA Today"
Powerful and vividly wrought . . . Novi writes about horrors with an elegant understatement. In cool, accomplished sentences, we are met with the gravity, brutality and even the mundaneness of war and loss as well as the enduring capacity to live. "San Francisco Chronicle"
Intimate and immense . . . a writer whose own gravity and talent anchor this novel. "The New York Times"
An important and profoundly moving reading experience. " The National"
A] powerful, gorgeous debut novel. Adam Johnson, "The Week"
An unforgettable portrait of how war forever changes the life of the individual. . . a writer working with deep reserves of talent, heart, and mind. Gary Shteyngart, author of "Super Sad True Love Story. Sara Novi was born in 1987 and has lived in the United States and Croatia. She is a graduate of the MFA program at Columbia University, where she studied fiction and translation. She is the fiction editor at "Blunderbuss Magazine "and teaches writing at the Fashion Institute of Technology and Columbia University. She lives in Queens, New York."